Jets spewing salty water vapor and ice from Saturn's moon Enceladus. Could the mix of water, salt and temperature enable life to exist there? 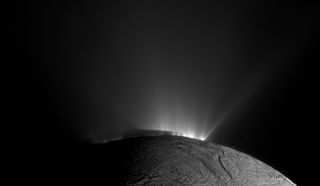 The discovery of plumes and subsurface oceans on Jupiter's moon Europa, organic materials on Mars, and the likelihood of hydrothermal vents in the oceans of Saturn's moon Enceladus, inches humanity closer to discovering life elsewhere. Such life would have to withstand extreme environments, and previous studies indicate that various types of bacteria can. They subjected the bacteria to sodium, magnesium and calcium chloride cocktails, as well as solutions of perchlorate, which is a chemical compound that may help Mars sustain liquid water during the summer. Lead author Jacob Heinz, of the Technical University of Berlin's Center of Astronomy and Astrophysics, says that the researchers expanded beyond the conventional sodium chloride solution because "there's much more than that on Mars." The underground ocean on Jupiter's moon Europa is suspected to be rich in salt and, on the occasions that the salty water reaches the surface, it is exposed to high-energy particles trapped in Jupiter's radiation belts that turn the salts deposited on the surface from white to a yellowish brown, as seen by previous space missions. Since perchlorates are toxic in large concentrations, researchers wanted to determine whether, how much and at what concentrations they might inhibit bacterial survivability. Survival rates for bacteria in perchlorate were far lower than in all the other solutions, although at temperatures as low as –30 degrees Celsius (–22 degrees Fahrenheit), the rates were slightly better. Heinz explains that the lowest freezing point depression – the extent to which a solute can lower a solution's freezing temperature – for perchlorate requires roughly 50 percent of the mass of the total solution, which is incredibly high compared to the freezing-point depression of other chlorides. Given its toxicity, the low survivability of bacteria in concentrated perchlorate solutions isn't surprising. Does that mean that Mars can't support microbial life? According to Heinz, life is still a possibility there. The presence of perchlorate "wouldn't preclude life on Mars or elsewhere," he says. "Bacteria in ten percent mass perchlorate solutions can still grow." Mars's surface soil contains less than one weight percent of perchlorate, but Heinz points out that salt concentrations in solutions are different than those in soil. Liquid perchlorate solutions can also be diluted to increase the bacteria's ability to survive, though a balance between concentration and temperature would have to be maintained. Theresa Fisher, a PhD student at Arizona State University's School of Earth and Space Exploration who focuses on microbial ecology and planetary habitability, agrees that the study's results don't rule out bacterial survival on Mars – in fact, perhaps the opposite. Places such as the Atacama Desert (the world's driest environment) in Chile and parts of Antarctica have relatively high perchlorate levels, Fisher tells Astrobiology Magazine. "I'd be surprised if microbes haven't evolved a way to deal with that toxicity," she says. Generally, colder temperatures boost microbial survivability, but temperature isn't a "one-size-fits-all" factor – the type of microbe and the composition of the chemical solution also determine the sweet spot for survivability. The researchers found that bacteria in a sodium chloride (NaCl) solution died within two weeks at room temperature. At four degrees Celsius, survival increased, and once temperatures hit –15 degrees Celsius (5 degrees Fahrenheit), almost all the bacteria survived. NaCl has a higher freezing point (–21 degrees Celsius/–5.8 degrees Fahrenheit) than the other salts; bacteria in the magnesium and calcium-chloride solutions had high survival rates at –30 degrees Celsius (–22 degrees Fahrenheit). This isn't surprising because "all reactions, including those that kill cells, are slower at lower temperatures," says Heinz, "but bacterial survivability didn't increase much at lower temperatures in the perchlorate solution, whereas lower temperatures in calcium chloride solutions yielded a marked increase in survivability." Results also varied between the three more conventional saline solvents. Bacteria in calcium chloride (CaCl2) had significantly lower survival rates than those in sodium chloride (NaCl) and magnesium chloride (MgCl2) between 4 and 25 degrees Celsius, but lower temperatures boosted survival in all three. Researchers subjected the bacteria to numerous freeze/thaw cycles ranging from 25 degrees Celsius (77 degrees Fahrenheit) to –50 degrees Celsius (–58 degrees Fahrenheit). Mars can undergo some pretty dramatic surface temperature changes, both diurnal and seasonal, depending on the location on the planet says Heinz. The average temperature on Mars is roughly –60 degrees Celsius (–76 degrees Fahrenheit), with temperatures at the poles dropping to –125 degrees Celsius (–193 degrees Fahrenheit). Consequently, bacteria need to be able to endure extreme fluctuations in order to survive. Generally, saltier solutions improved freeze/thaw survival rates. According to Fisher, "bacteria, when stressed, have shock responses. They manufacture specific proteins that help them adjust, survive, and cope with detrimental environments." Adding 10 percent sodium chloride decreased the microbial death rate from 20 percent to 7 percent and increased the number of freeze/thaw cycles the bacteria could sustain from 70 to 200. Bacteria manufacture stabilizing proteins as a shock response to severe environments, Fisher explains, "but there are only so many shock proteins bacteria can produce." The survival rates of bacteria in various types of salt – sodium chloride (NaCl), magnesium chloride (MgCl2) and calcium chloride (CaCl2). In general, the cooler the temperature, the longer they survived. While the study provides insight into extraterrestrial microbial possibilities, Heinz emphasizes the difference between surviving and thriving. Just because bacteria subsist in certain conditions doesn't mean they actually grow. Heinz is currently working on another study to determine how different concentrations of salts across different temperatures affect bacterial propagation. "Survival versus growth is a really important distinction," Fisher affirms, "but life still manages to surprise us. Some bacteria can not only survive in low temperatures, but require them to metabolize and thrive. We should try to be unbiased in assuming what's necessary for an organism to thrive, not just survive." Studies that explore various salt solutions, concentrations, and temperatures help scientists focus the search for life, or at least not rule out possibilities, such as microbial survival in toxic perchlorate. Other variables affect the search for life, such as a bacteria's ability to withstand radiation or extreme atmospheric pressure. There may even be factors we don't know about yet, but with each study, there's one fewer haystack to search.